As always, fashion is a revolving door and it seems that palazzo pants have come a knocking once again. As a thirty-something still on the quest to lose a few more pounds, I'm secretly happy to see wider, flowing pants in style when the world's been a sea of skinny jeans. The new silhouette may seem a little overwhelming (tons of fabric and all), but palazzo pants are so easy to style, and work in a number of really different looks. 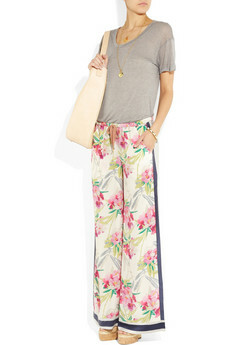 If you don't believe me, check out the asos.com pants shown above. Those are the similar pants in colour and style but the outfits work for two separate looks just by switching up the top and accessories. A bright striped tee makes the look super relaxed, while a tucked in blouse and pumps creates a polished evening look. If you're going for a super trendy look, try bright on bright like this look from Forever21.com, or, go the pastel route with a made to order pair from Etsy. And while it's safe to go with solids, I dare you to get prints whether they be classics like these striped wide legs from Zara, or statement making florals like these gorgeous Elizabeth + James pants from Net-a-Porter. 1. Pair with fitted tops. A silhouette that fits close to the body will offset voluminous pants. 2. Step out in higher heels. They'll lengthen you even more. 3. Experiment with different looks. Be brave and play dress up with crop tops, peplum blouses, oversized accessories, boyfriend jackets... make the look your own! 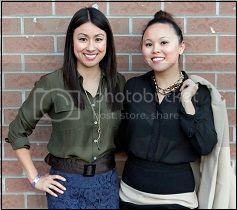 -- Tamika Auwai is a style junkie, splurge-a-holic and founder of Shop Socials. The pants are wonderful and I love them. Possibly show a woman with hips, thighs and a shorter height wearing them and it'll draw more attention I'm sure!